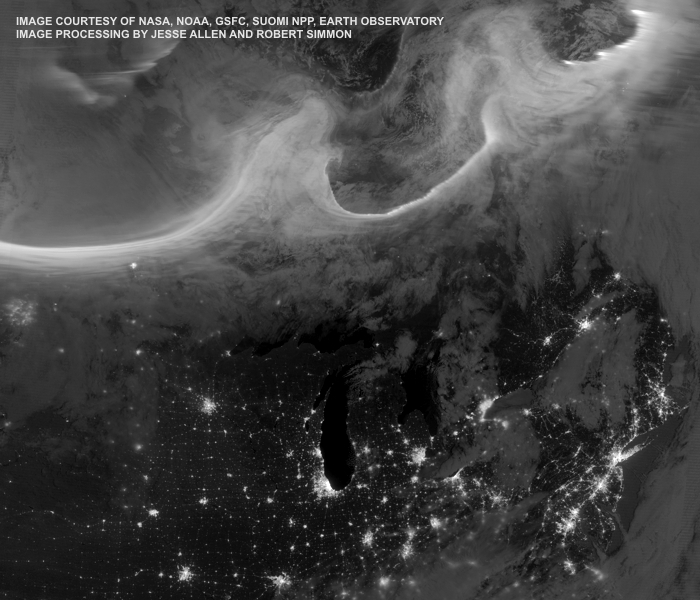 This spectacular aurora image was taken by the Suomi-NPP satellite on October 8, 2012. The image was captured with an infrared camera, so it’s reproduced here in grayscale. None of the usual aurora colors are visible, but you can clearly see it just north of the Great Lakes. The aurora is that ghostly gray “curtain” above south-central Canada. It’s total length was more than twice the 1600 km (1000 mile) shown in this image. I won’t be saying much about the aurora phenomenon itself. If you want to know more about what they are and what causes them, see my Feb 20, 2012 Sky Lights. You’ll also find a beautiful full-color aurora shown there. What I want to focus on here is the magnitude of this particular aurora. It was huge, spanned an altitude from 100-400 km (60-250 miles), and was visible to many observers throughout the American Midwest. On October 4-5, three days earlier, a large coronal mass ejection (CME) erupted from the surface of the Sun. It was aimed almost directly at Earth. More often than not, the rotating Sun fires in other directions. These blasts of charged particles stream through space at the incredible speed of 500 km/s (300 miles/s). And that’s an average — they’ve been observed to move at six times that speed. When these charged particles (primarily electrons and protons) hit Earth’s magnetic field, they get deflected toward the north and south magnetic poles. That’s why they’re more common at higher latitudes (>45°). The more energy they have, the farther south they’ll push. The aurora has, on rare occasions, been visible from Florida (latitude 25°). When these charged particles hit Earth’s atmosphere, molecules of oxygen and nitrogen are stimulated by the energy and emit photons of light. More energy = more light. The colors come from the different atomic structures of those molecules. Unfortunately, in addition to the beautiful light show in the sky, some bad things can happen at ground level. There’s not much radiation danger to people on the ground, but when a large CME hits Earth, astronauts in orbit need to take shelter in a specially shielded “safe room.” Anyone flying at high altitudes will also receive a dose of radiation in excess of normal, but it’s hard to measure this effect. Satellites in space are particularly vulnerable, even though most have radiation shielding. CMEs have irreparably damaged satellites on several occasions. The scariest aspect of CMEs is the potential effect of their electromagnetic pulse (EMP). Through the process known as electromagnetic induction, large electrical currents will be induced in metallic objects. These currents can knock out electrical grid generators and transformers, and communication networks. Recent popular media about the potential global hazards from EMP do not exaggerate the danger. This is why scientists monitor the Sun continuously, watching for CMEs and solar flares. Even 24 hours advance warning would allow us to put critical systems into safe mode. 2013 marks the peak of the Sun’s 11-year activity cycle, a so called solar maximum. There will likely be more CMEs and solar flares than average this year. And I feel safer knowing some very smart people are keeping watch for us.